TURN THE KEY AND MOVE INTO THIS Nearly new HOME! EVERYTHING IS DONE FOR YOU!!! !4 bedrooms w/walk in closets, 3 baths, granite, loads of cabinets with soft close, breakfast bar, dining room, eat in kitchen, office, gas fireplace with stone surround, huge master bedroom with tray ceilings, AMAZING floor to ceiling ceramic shower in master bath, dual sinks, 3 zone heating system! Spacious Lower level Rec room and kitchen with wet bar, refrigerator, microwave & more counter space! Walkout basement that leads to a back yard. Enjoy the quiet back yard without neighbors behind the home! Situated on a 1/3 of an acre! Perfect for IL and MKE Commuter! 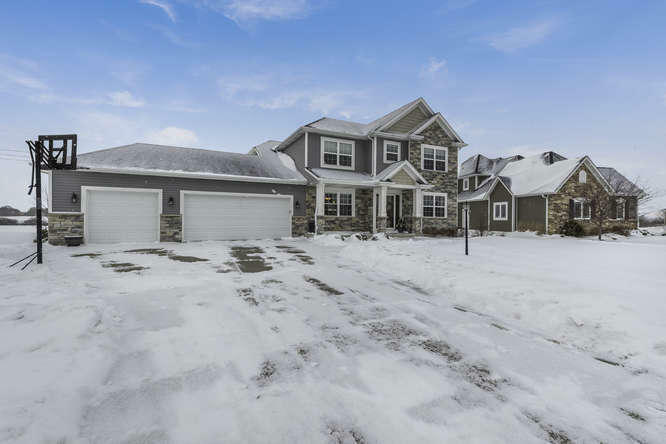 10 minutes to Interstate 94, shops, schools and restaurants! PLEASANT PRAIRIE LIVING AT ITS FINEST!!! !